The goal of the “Charming” project is not only to better and more effectively train industry workers in a virtual environment than before: the project also aims to get children and teenagers interested in chemistry. When work at a chemical reactor is not able to go on normally for an entire day because its workers are attending a training, this quickly becomes very costly for a company. 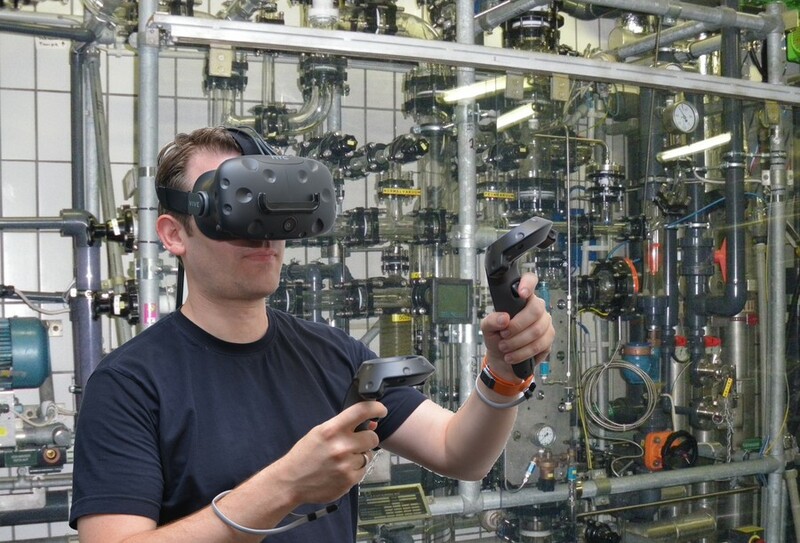 “Our idea is therefore to create a virtual reactor in which chemists can train under realistic conditions,” says Dr. Thies Pfeiffer, who heads the Virtual Reality Lab at the Cluster of Excellence Cognitive Interaction Technology (CITEC) at Bielefeld University. In conjunction with other Bielefeld researchers Pfeiffer is participating in the “Charming” project that will begin in November 2018. Spanning seven countries, the project will run for a total of 48 months, with a funding volume of 4 million Euro. One goal is to use virtual simulations to train chemists more effectively than with previous methods. “In addition to this, we also want to get schoolkids and teens interested in the chemical industry,” says Pfeiffer. At Bielefeld University, Privatdozent (Senior Lecturer) Dr. Sven Wachsmuth, who heads the CITEC Central Lab Facilities, will also be participating, as well as Professor Dr. Friederike Eyssel of the Faculty of Psychology and Professor Dr. Gisela Lück from the Faculty of Chemistry, both of whom are providing support to the project in an advisory capacity. This is also the goal of the “Charming” project, which is to meant to allow for basic skills to be trained in virtual environments. “For this, very different concepts and prototypes will be explored,” explains the researcher. Schoolchildren aged 8–12 years old, for instance, should be able to experience and test chemical reactions in a virtual space, and have a lot of fun while doing so. The project also focuses on schoolchildren and students aged 15–23 years old. “In this age group, it’s all about learning to understand and practice controlling chemical processes,” says Pfeiffer. Participants can, for example, perform challenging reactions in the virtual setting without the risk of injury if something were to go wrong. Finally, another cornerstone of the project are workers from the chemical industry. “Using comprehensive simulations, we want to better prepare them to operate equipment,” says Pfeiffer. “In addition to this, we can safely prepare them for exceptional situations, particularly those that fall under explosive protection.” According to Pfeiffer, much of the content here is extremely complex, and for this reason, it is difficult to learn only in theoretical terms without trying it out. At Bielefeld University, the initial focus will be on developing the technical components for the project. The expertise of the Cluster of Excellence CITEC and the Bielefeld University’s Research Institute for Cognition and Robotics (CoR-Lab) are incorporated in this development. “We want to test out different approaches with which the training units can be designed and adapted in such a way that they correspond to the skill level of the trainees,” says Sven Wachsmuth. The CITEC team brings to this work many years of experience in virtual reality training simulations, including those for motor learning and processes in nursing education as well in testing accompanying assistive systems using Smart Glasses. The full name of the “Charming” project is “European Training Network for Chemical Engineering Immersive Learning.” A call for applications for a total of 15 doctoral researcher positions has been posted for “Charming.” One of these positions will be at Bielefeld University. Project partners are located not only in Germany, but also in Belgium, Denmark, France, Great Britain, and the Netherlands. “The target group is specifically doctoral students from abroad,” says Pfeiffer. For this reason, doctoral students who lived in Germany for longer than a total of 12 months in the last three years may not apply for the position at Bielefeld University. In such cases there are doctoral researcher positions at partner institutions available to interested applicants. “Over the course of the project, the goal is to spend several months abroad at partner institutions,” says Pfeiffer. “Charming” is being funded by the European Union’s “Horizon 2020” Innovation and Research program (funding code 812716).